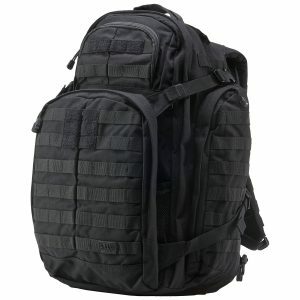 Recently, I purchased the RUSH 12 as a trekking bag, but I have really wanted the 5.11 tactical RUSH 72 backpack for a long time for being my ultimate bug out bag. I finally purchased it and I am so glad that I did. This is the one pack that I keep loaded down with all my needed items that I can just grab and go when I am in a hurry, and the RUSH 72 literally does it all. There is too much room in this bag, and I love the fact that it can be laid flat and that the main compartment is able to be unzipped all the way around so it become a front loaded bag. That is beyond awesome in my book. This is what makes it so simple to stock in its place within this pack without having to dig through all the stuff in your bag just to get one single item. 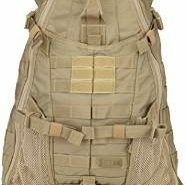 It is really roomy, but it is quite comfortable because of the MOLLE equipped middle belt, it takes the force of your stuff from your shoulders and into your waist where it really belongs. That makes it great for those who often get stiff trekking long distances with a bag on your back. This is one bag that is really durable. That is what sold me on it, and it is a real testament to the 5.11 items quality. The bag is super tough and flawless. Although, it is a bit heavier than the other bug out bags that I have owned, simply because it is made from the greatest nylon that I have ever seen on any other type of equipment. There are no missed stitches, or frays. It is tough enough that I would be comfortable to throw it off a cliff and not have any major damage done to it. There is one large major compartment, one big front compartment, and 2 side chambers, a hydration compartment, and some smaller pockets. These all have firm inner zippered and non-zippered pockets. It has straps that hold it to the main compartment which was made for expanding the bag. The front compartment has a gap between this pocket and the large pocket, but the nylon straps are normally loose and allow you to put in whatever you need such as small camping items. I managed to fit a small camping tent, inflatable camp out pad, cook set, 3-liter bladder, first aid kit, water filter, dried foods, some paracord, multi tool, and a machete as well as a few other odds and ends. I won’t lie, I have carried a whole lot of civilian backpacks but I have also carried a few military rucksacks. This bag is actually really great for its size. 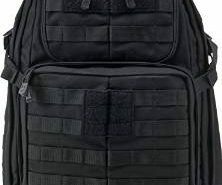 It is perfect to make a 72-hour bug out bag that has a bunch of alternative pockets and MOLLE webbing all over the bag. 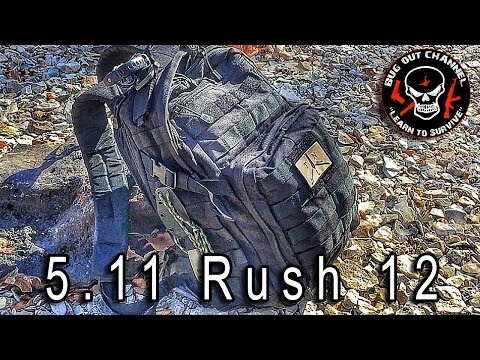 The 5.11 tactical RUSH 72 backpack was one that I was quite surprised to find that it worked perfectly for many of my treks, hunting trips, and even my man in the wild hikes up in the wilderness. This bag can hold my food, clothing, and shelter. I don’t think that there is going to be any other type of bag out there that can really do that. What is better is that it also has a tier strap system that will let you connect your RUSH bags into one large carry on for luggage when you are traveling on planes. Being able to pick out the right type of bug out bag and getting to be the right size was a bit challenging. If it is too large then you will be dragging out a lot of luggage, if it is too small then you are stuck tying your gear to the outside of the bag and end up snagging everything. 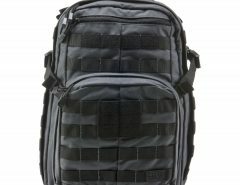 Having a good quality bag was really important and the 5.11 has a great reputation among civilians, dooms day preppers and even survivalists. To be honest this is the best bug out bag that there is. The quality of this bag is great. I love that it was literally made to be able to withstand years and years of abuse. I am constantly on the go, and this has literally become my go to bag and when I am ready, it is right there, ready with all my gear. Another thing that I loved was that there was so many pockets. There are so many of them and they are all usable and easy to arrange. It helps me to stay organized, which is a plus. It is customizable and expandable. The MOLLE webbing allows for there to be some pretty awesome MOLLE attachments. It was built to be compatible with the Camelback. Plus, it is the right size to work for a 3 or 4 day wilderness trip in cold weather. There is just one issue; it is a bit expensive for some people. No it is not cheap, and you are getting what you pay for. Overall, this is a great bag that is of excellent quality, perfect size, and a lot of organization that I really need for my gear. I have managed to get the chance to carry mine all over as a carry on when I flew, as a laptop bag, and some major hiking. There is a lot of room in this bag and it literally lives up to that 72-hour concept. I honestly prefer the storm gray color, as many people do not really give it a second glance, so you are less likely to be robbed. This is one of the best bags that I have ever owned and I will continue to use it until it finally gives out and becomes something that I can keep because I have had so many awesome adventures in it. You certainly cannot go wrong with the 5.11 tactical RUSH 72 backpack.